Providing you the best range of spring hopper loader, pvc pipe hopper loader and pipe cutting and chamfering units with effective & timely delivery. We, Candour Machinery Pvt. Ltd. combines engineering brilliance to give the cutting edge to the Powder Conveying System. We believe that the solution arise from within the problem, hence one users friendly and cost effective solution to your entire conveying system. Since each product is unique in it's own way, Candour Machinery designs & customizes special powder conveying spring hopper loader to suit your particular need. The hopper loaders are used for conveying powder to main hopper of extruder with length of 6 mete to 12 meter. Our hopper loader are used by top name in the industry, people who prefer nothing but the best. v All Electrical parts are of std make like BCH, L & T, Schineder electric. v Suitable wire mesh to avoid material particle flow to main machine. 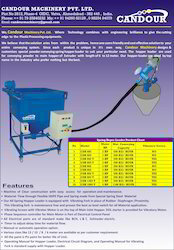 v Vibratory screen to allow smooth material flow to main machine Manual. v Various sizes like 10 meter / 8 meter / 6 meter are available as per customer requirement. We, Candour Machinery Pvt. Ltd. combines engineering brilliance to give the cutting edge to the Powder Conveying System.We believe that the solution arise from within the problem, hence one users friendly and cost effective solution to your entire conveying system. Since each product is unique in it's own way, Candour Machinery designs & customizes special powder conveying spring hopper loader to suit your particular need. The hopper loaders are used for conveying powder to main hopper of extruder with length of 6 mete to 12 meter. Our hopper loader are used by top name in the industry, people who prefer nothing but the best. We at Candour Machinery manufacture best quality of Pipe Cutting and Chamfering Units. We provide this product at affordable price and is in huge demand by our clients.